HELP*! I need to take something over to my in-laws place for Christmas. Nothing fancy, just an appetizer or two. The problem is, I am never home on Christmas Eve to prepare something, as I spend the days leading up to Christmas with my side of the family. The criteria for my selection? Something that freezes well, is easily portable and tastes really good. The solution- A cheese log! This recipe does not take long to prepare and the kids enjoy rolling the mixture into a log shape. The cayenne pepper gives the cheese log a slight kick. Covered with sliced almonds the log looks quite lovely and is usually a welcome treat. 1/2 cup of almonds (plus extra for covering log, the amount will depend on how much you like almonds) You can also substitute the almonds for walnuts if your prefer. Mix all the ingredients except for the extra almonds until well combined. Put the mixture on a piece of wax paper/ saran wrap that is big enough to cover it. Using the wax paper, roll the covered mixture into the shape of a log. The thickness and length is totally up to you. 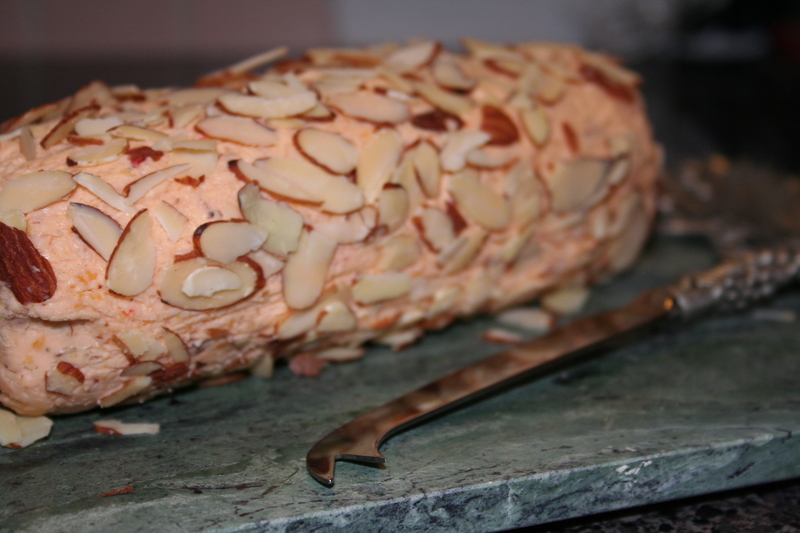 Then sprinkle the extra sliced almonds on the top of the log and on the wax paper. Roll the log, so that all sides are covered with almonds. If the log is too long, cut it into suitable lengths. You can freeze each section separately, but make sure you wrap each section up properly to ensure that the log stays fresh. Remove from freezer a few hours before serving to defrost. Serve with crackers of your choice. I have a cheese board that I take with me on which to place my cheese logs and crackers. You could also garnish the cheese board with grapes and parsley. *I am blessed to have wonderful in-laws who would be happy even if all I brought was a bag of chips. I love cheese! I think I’m going to try making one. Seetha, that sounds delish! Gotta try to make this recipe. I usually offer to bring a dessert as it can be made in advance and everyone in my fam loves something sweet. Mmmm, this is a really good appetizer idea! I am collecting the recipes for festive evenings in winter here t our place and I am sure that this one is definitely among them! Thank you for sharing it!